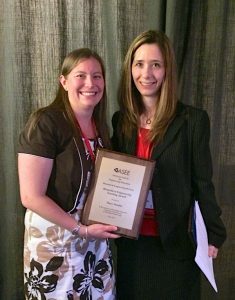 The Biomedical Engineering Division of ASEE offers several awards in recognition of the work of its members. Past winners of the below-named division awards can be found here (our web site) and here (ASEE web site). For instructions on how to apply or nominate a colleague, see the official ASEE page, or contact our Awards Chair. This award recognizes the contribution of Theo C. Pilkington as a true pioneer in Biomedical Engineering who contributed significantly to the advancement of Biomedical Engineering Education. This award is conferred by the division for significant contributions to biomedical engineering education as evidenced by the development of successful undergraduate or graduate level programs, curricula, publications as well as by membership and activities in ASEE/BED and other biomedical engineering organizations. The award consists of a commemorative plaque and a check for $350.00. This award is conferred by the Biomedical Engineering Division (BED) to recognize contributions in the field of biomedical engineering education by new faculty members as evidenced by innovative teaching materials, curricula, textbooks and/or professional papers and by activity in ASEE/BED and/or other biomedical engineering organizations. Awardees must have a primary educational role in biomedical engineering, either through a dedicated BME/Bioengineering program or through a related engineering program. Only faculty members who have no more than 5 years of teaching experience (by June 1 of the year in which the award is given) with primary course responsibility at the university/college or community college level are eligible for this award. The award consists of $350 and a commemorative plaque. The Best Paper Award recognizes the best paper presented in a session sponsored by the Biomedical Engineering Division during the ASEE Annual Conference & Exposition and published in the Annual Conference & Exposition proceedings. The award consists of $200 and a plaque, which is presented to the author(s) at the Biomedical Engineering Division’s Awards Banquet at the Annual Conference & Exposition in which the paper is presented. The award is based on the extent to which the paper advances knowledge or creative practice in the field of Biomedical Engineering Education, the utility of information to a wide range of Biomedical Engineering Educators, and the clarity of writing, originality, innovation, and documented results.